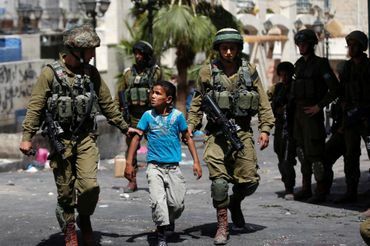 Human Rights Watch accused Israel of "abusive arrests" of Palestinian children as young as 11 and of using threats to force them to sign confessions. where you from sam? jersey? of the two million children arrested yearly by our country, how many you think came from jersey? i'll bet my life and the lives of my children that jersey arrest more kids in a month than israel in a year. "Forces have choked children, thrown stun grenades at them, beaten them in custody, threatened and interrogated them without the presence of parents or lawyers, and failed to let their parents know their whereabouts." Don't bet your life or the life of your children, Justin. I value those lives, Justin, and so do you. And if Jersey did it, it would be as wrong! Absolutely unacceptable.....Innocent Palestinians have suffered enough from abusive government and rulers including their own. They are the victims of power.....walk in their shoes. Thanks Sam! Sam, what do your ISIS brothers do to the youth they don't like? Glad to know that Human Rights Watch is doing this. Children need to be protected from violence. Sorry I don't understand others' comparisons since this is an article about something specific. Would people seriously try to use comparisons as a defense? Cold-blooded, mean & heartless. If they didn't throw rocks or behave like savages they wouldn't get arrested. Sadly their parents are happy to sacrifice them on the altar of martyrdom. The depraved not only justify the arrest of children, but aspire to having them killed as well. They also refer to the children as savages, the same term applied to Native Americans by the settlers! They see no savagery in the behavior of the soldiers towards these children! Those debased Zionists are rotten to the core! Israel really seems to be going overboard now. Another sad report. Simply amazing how glibly some people can justify these documented abuses. I'll never understand it. Thanks Sam for the article. This longstanding routine practice hasn't so far bothered or impressed neither US officials nor Israel, which denies everything anyway, so why should it now. Just another reflection of the "shared values". Well, of course, you're right, Angelika! But don't underestimate how the world views Israel and its criminal behavior. The reason the BDS movement is embraced by the "average" citizen of the world is because indifference stopped being an option. Israel's crimes already reached a tipping point. Let Israel continue to defend its crimes. That can only strengthen the resolve of those who see things the way they are! Yes, that is true Sam and I do realise this and I'm not underestimating (or is the word "misunderestimating" - LOL) the world's eyes watching what cannot be tolerated any longer. Even without the last 3 wars they've been turning a blind eye on these crimes against children for way too long. What's still missing, however, is that resolve turning into appropriate action beyond the BDS success and mere words of criticism and how "deeply concerned" they all are.